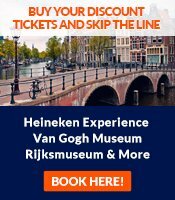 So here's a directory of other good Amsterdam sites informing you on sights, museums, current affairs, things to do, etc. If you'd like to suggest a site for inclusion, please use the form for this. An excellent site by the Amsterdam city administration meant for all foreigners in the city: tourists, expats, business people, etc. Next to tourist information it also has the details about taxes, permits, rules for foreign businesses, etc. The Rijksmuseum (National Museum) is where everybody goes who wants to see the Dutch Golden Age paintings and other art. However, a large part of the museum is closed until 2013. Only a number of highlights - including Rembrandt's 'Night Watch' - are showed in one wing of the museum. The leading Amsterdam museum for contemporary and modern art. The former location is closed due to renovations (too), and the museum is traveling through town in hired locations. A good site for those who like to light cigarettes with a little extra during their stay in Amsterdam. A free, English-language weekly newspaper distributed in Amsterdam. It's especially strong on culture and art, what's on, and expat issues. A site to keep you updated with the latest news headlines from Amsterdam. The site of our local cops, with valuable information (also in English).